Ideas on minimalizing, simplifying, and frugalizing. I feel like this whole week has been full days of cleaning and organizing. I am not very into my writing…well, I’ve actually just put it to the side for now. Blogging is fun so I do that on a regular basis. No, my days are filled with deep, fall cleaning, washing wood floors, shampooing area rugs, washing throw rugs and shower curtains, and clearing out a lot of clutter. I feel like my stuff makes more stuff at night unsupervised. Then with grannie moved in we have accumulated more stuff. We had set up a sewing table in the dining room that was only graced by her presence a couple times, just long enough for her to look at the sewing machine in a confused way. Turns out she bought the machine at a garage sale with no manual and doesn’t know how to work it. Yes, I know there is the internet to teach her but the sewer is just collecting dust so I moved it and the table onward and out recently. 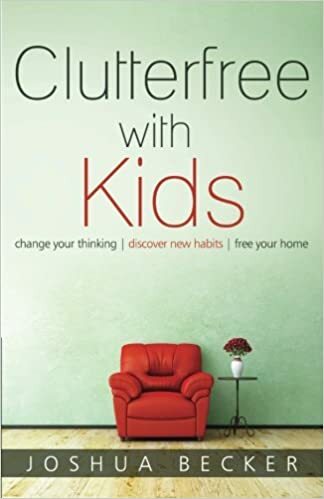 I found a book ClutterFree with Kids by Joshua Becker. I had ordered it at the library and it just came in. I’ve been at this clutter free and simple living business for years but I like this book and got some new things out of it. First, I was reinspired when he talked about all the energy that goes into cleaning, organizing, and storing our stuff. I feel that lately, that it’s hell to clean because I have all this extra furniture to move about. My house felt crowded and grimy. It makes me feel a little nutty and hostile. He talked about a closet and having only 33 garments. When he said night clothes, undergarments, and lounge clothes were not included I thought that sounded too easy. It’s not. But I took up all the challenge and I now only own 33 garments. It’s really freeing actually. For a week I set about washing, scrubbing and donating stuff. I rearranged rooms, put furniture out in the garage. I don’t want to get rid of too much. I’ve done that before and regretted it. Some items go to the garage for a holding period. The toys are mostly stored in tubs in the garage but we had an issue recently with little legos and the toys we did have would be poured all over the place by Sammy and left in piles to litter the rooms. These little legos are extremely dangerous, painful to step on, dangerous for a grannie who shuffles about and could break a hip, and it makes my home look trashed. I packed up every single piece of lego and tinker toy and other toys except some dinosaurs and large blocks and puzzles. They have one tub of toys available now and they haven’t missed all the other stuff at all. When kids have fewer toys they really, really play with them. When they have tons of toys they just pour out piles and throw them about and then leave for greener pastures. I see this with my boys and hear this all the time. All their toys are safe and packed away clean and I will rotate every month or so. One tub at a time. I then hauled the extra table, sewer, chairs from the last party and other furniture I didn’t need to the garage. I even hauled the bedroom TV. My husband has utilized it all and hooked up the TV with the old HD antenna and now has a very fun man cave. Good for him. One less person in the house talking at me. I gave nick nacks and a cake display dish away and I am lighting and using all my scented candles daily. Why save stuff? For what? Whatever I’ve been saving for hasn’t happened in 6 years. I cleaned out drawers and closets. I rid myself of things that are tacky, not used, stained. I kept only the things we love and use. I even got rid of the plastic table clothes. I rearranged what was left (a lot, fret not, we won’t be sitting on pillows Japenese style). I steamed floors, scrubbed, polished. My home looks great, feels more open, smells good. I have the wax scent burners going and my big scented candles lit. I feel like the more we give away and clear out the more room we make for quality. Quality items, time, and people. Decluttering can go as deep as paperwork and photos. I go in and clear out hundreds of silly photos that are blurry or of someone’s hand or cheek. I keep the best photos. I only keep the necessary paperwork. I declutter and organize monthly. Sometimes we have to make a big week of it when we haven’t done it for years. Decluttering can even go as far as people, events, scheduled appointments, time spent with others. I have really downsized my calendar to only what has to be done such as doctor appointments for grannie and shopping for groceries and library. I am soooo picky as with what we do socially. Nothing worse than spending time with people you don’t really enjoy or inspire you. I am homeschooling my oldest and it’s very easy right now. He does some fun work on the computer daily, we read books on dinosaurs or whatever interest him, we watch documentaries and do puzzles. My boys also help bake, garden and tend to the hens. But my boy needs friends. We have a lot of friends but they are all too old for him. His friends are in their 40’s, 50’s, and 60’s. He does have a couple friends age 11 and 17. He has grannies grandson lately who is 7 years and does sleepovers and they have a great time. I see that he is hungry for the companionship of his own age. Arjan doesn’t understand age so he says he wants friends the same size as him. I am not into these homeschool groups so much. I tried 5 groups before he was even ready to do schooling and I found them exhausting. But my son is so important. I rejoined the Yuba City one the other day but most activities are for older kids. I did find this fantastic group called Hikers with Kids. I joined. What fun to go out into the wilderness and explore with your kids?! I also signed Arjan up for Fox Walkers in Nevada City. This is a fantastic program, especially for homeschooled kids. They run around in the forest, track animals, build shelters from sticks, climb trees, grind acorns, and learn all sorts of Native American ways and how to connect to Mother Earth and Spirit. What a great thing for children! He will do this every Friday for the next year on into summer. It was a chunk of change. Which brings us to the frugalizing part. I blew all sorts of money at this hideous Halloween City. If you ever see one look away. They sell a bunch of junk made out of styrofoam and polyester and charge a pretty penny. I blew $334 for trash I can’t even salvage after a month of wind and rain. I learned a huge lesson. I can barely even write about this. When I think about the huge TRex display in HomeDepot that is $299 and I wanted to just get that and put it in our yard for laughs and fun. I said, “oh no, too much money but wouldn’t that be fun?” It looks like the fossilized museum setups. You know how much fun the boys and neighborhood kids would have had with that. A huge fossilized TRex in the Singhs yard. And he could stay year round. It was sturdy. Now I have foam tombstones that are already laying on the ground from the winds and some cobwebs that won’t make the rains, a spider falling off the bush and a stupid skeleton that keeps falling down from the porch hanger. Sigh and grumble. I’ve set goals and budgets each week and month lately to save and pinch and it seems to go South immediately after. This happens. I make plans to save and immediately spend a small fortune. I do have one smart set up. I have a separate bank for our big savings and I have all my royalties deposited there. It is untouchable. Well, I could touch it but it’s work. It is on the other side of the street and I don’t have an atm card. Yay for figuring out how to outsmart myself! I’m getting back into the thrifty and penny wise though. I tried to donate all those clothes to the refugees from all the fires and they had too much already. I tried selling them at the cash and clothing store and they only took one item from 4 bags. Ridiculous. I donated to The Good Samaritan. I did buy one pair of leggings for $5. I wanted to haul out all sorts of things but I refrained. Quality, not quantity. I also refuse to shop outside the grocery shopping day. If we don’t have something we make do. Every time I make a run for a small item I wind up buying 50 items. See, there are all these ways we sabotage ourselves. Even if you have a frugal life, you can still stumble in little ways. For me, it is very hard to save money even with a goal in mind. It’s easy for me to not go out. I’m used to it and find myself very disappointed when I do go out to eat. I don’t think I’ve purchased anything from an actual department store in years. I find quality furniture and clothes at garage sales and thrift stores for a quarter or less of the price. Sometimes hundreds of dollars less. Movie theaters are my thing and there is one movie every so often that I want to see. Bars, parties…we are too old. We don’t drink, smoke, do drugs. That saves a ton. I hear young families talk about being broke and I’m thinking that if they stopped buying pot, beer and cig’s they might find some extra cash at the end of the month. It’s the saving of the coinage. So, I have the bank trick and I have our tax returns deposited directly into the bank savings each year. This way I’m saving monthly and yearly far more than I would with Bali’s paychecks. Previous Thoughts on weight loss, tiny houses, and and a positive attitude. Next The joys of the simple life. Why we choose it when we choose family. I have heard of the 33 pieces of clothing. I usually have ‘outfits’ that I put together for special occasions and just wear over and over–hey, if I look good in it, why should I go out and spend more money for something that may or not look good? I’m doing the purging right now too, and I’m pleased to say that I am having a hard time finding stuff to get rid of. Apparently I have been purging automatically ever since we moved here a year and a half ago. The one room I haven’t done much in is the Redneck’s ‘cave’. Hey, I got it clean, HE can do all the purging and organizing! Since I’m the one everyone calls to come get all their purged stuff, leftovers from yard sales, moving, etc, I have to constantly purge as I go through it all. Sometimes I keep a bowl or piece of decor, maybe clothing I like or books I want to read. All the rest I donate to local charity shop or I pass it on to another friend who needs it. If I kept even 1 percent of everything I am given–I couldn’t walk through my house.